Michael: You will be using the key of A. The jam track has bass and drums only. You will be using the A9 (I), D7 (IV), E7 (V), to play over this track. Michael: There is a C# in the A9. Michael: OK, now try playing the rhythm over a jam track with the guitar added. johnny: Question teach. Are those chords minor 7 and 9? Teacher: The next lick uses more of the A Minor Pentatonic scale. This has a pretty cool run using the scale pattern. Try to play the 2nd and 3rd licks together. Steve: It all stays in the same area. 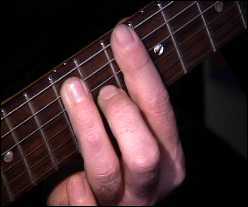 JoeK: Teach, do you barre the 5th fret or (my guess) move your 1st and 3rd fingers around as necessary to play lick 3? Michael: The last tab shows the 1st position and 2nd position of the A Minor Pentatonic scale box patterns together. See how they consist of the same notes, only different positions. You can jump between the patterns easily. The next lick uses the A Major Pentatonic scale again, only different position. This scale has kind of a BB King sound to it. 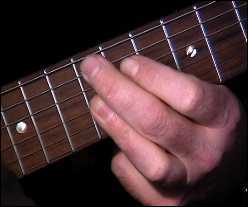 JoeK: Should you limit the use of the major pentatonic notes to keep a bluesy feel? or move freely between patterns? Teacher: Joe, you would be surprised how much BB King actually plays using the Major Pentatonic scales, it's signature to his style of blues. JoeK: How about Buddy Guy? 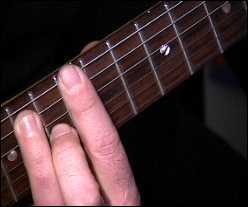 Michael: This lick has a nice feel and flows well, any trouble playing this lick? johnny: Question...in the blues progression, does it matter when you play the minor pentatonic versus major pent? Michael: Johnny, why don't you try playing everything in the Minor Pentatonic the first time and then playing the Major Pentatonic the second time through the progression to get a feel for each scale. Then try mixing the patterns up, you'll be surprised on the combinations you can come up with. JoeK: From what you are showing tonight, it looks like, in Blues, you can mix add individual major pent. notes to a lick AND you can add whole major pent licks that tie into the minor stuff. Is that right? Michael: Exactly, that way you can hear the contrasts in sounds you can create, you might like one over the other, or combine them like we did tonight. See you all next lesson!